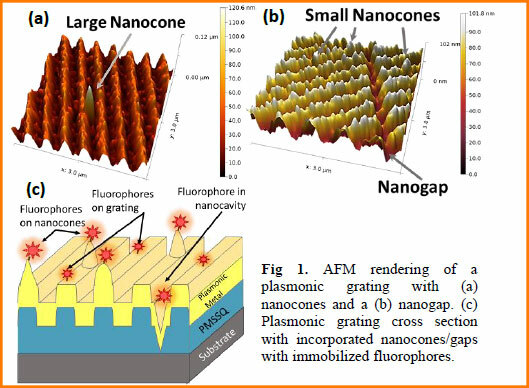 Enhanced Plasmonic Imaging provides a novel nano-grating structure that uses a more efficient and cost-effective surface patterning process. Instead of expensive traditional e-beam lithography techniques, this technology uses plasmonic gratings fabricated as soft/hard hybrid nano-structures. Graded nano structures produced enhancements 47 times better than flat gold. Nano-cones enhanced the light up to 38 times that of flat gold. Nanogap within the grating structure created from an HD-DVD master mold. Commercially available molds from CDs, DVDs already have this grating structure. The mold is nano- printed with a polymer ink and then covered with a highly controlled thermal deposition of a thin plasmonic metal layer such as gold. The process also includes treatment with a hydrophilicity agent and the addition of a capping layer on top of the reflective layer. Gold, silver or aluminum can be used as the reflective layer. Exactness in this three-layer process creates a nano-surface with extraordinary concentration of incident light. The result is enhanced image contrast and detection. The polymeric gratings post-stamping, crosslinking, and heat treatment are stable for up to 12 months in a reduced humidity chamber (7% RH) at room temperature. Scientists are working to improve the stability into longer term (years). This technology is superior to near field-scanning microscopy in that it does not need a probe that distorts the local environment and it can scan the entire sample at one time. The light enhancement allows for as good or vastly better imaging with a high level of accuracy.